A web form is an area that can contain form elements. Form elements are elements that allow the user to enter information in a form. The data entered by users are sent to a server for processing. 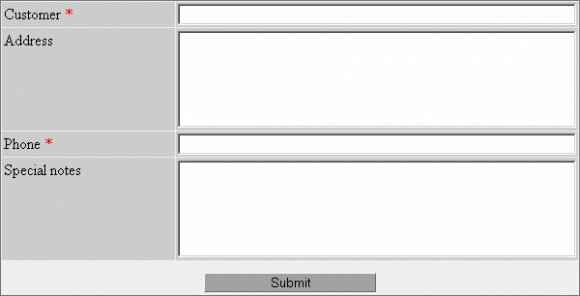 PHP web form looks like a paper form because site visitors fill out the forms using checkboxes, radio buttons, or text fields. Typical use for web form is to create questionnaires, contact web form, request/register forms, surveys, polls or a front end to issues tracking systems. Each of these could have a customized form for end-users to fill out. If you need to build a lot of customized, one-off forms, a web form is the most suitable solution. Web page form is often used to enter shipping or credit card data to order a product or can be used to retrieve data (e.g., searching on a search engine). A web form is defined in formal programming languages such as HTML, Perl, Java or .NET. Web form submit information is saved in a database table and can optionally be mailed to the e-mail address stated. Web forms software (i.e. PHP form) usually includes a web form tutorial so that anyone with no programming skills can easily create a web form. Html web form is a splendid solution for websites that need to create a number of regularly changing forms. Web form doesn't require installing a content type for each different form, instead each form is connected to a particular node. Using a form wizard you can design simple or complex forms that send you an email each time your visitors submit them. After creating the web form, you get a HTML code to paste in your website, and the form will be there and working. Captcha Image displaying letters and numbers which are difficult to be read by non humans, stopping 100% automated submissions. Great~~~I like it``and keep updating your works. and here is my fashion caps shop www.fashion-caps.com can you give me some advise.Thank you! how to put this in my website? Welcome to a new type of professional Website Layouts. I made this one for fun, I had no Idea's, and I just wanted to try something new, so here it is. cause the Layout pattern, And I hope you'll like it to. Enjoy :). Credit is authorized to keep in order to use this domain Layout.